This is a common lichen of dry, acid rock outcrops and boulders, especially where sheltered by overhangs. The thallus is formed of dull yellow, rather plain areoles (little jigsaw pieces of thallus) with margins that become increasingly powdery sorediate (pale yellow) until eventually, the soredia dominate the thallus. Discs are rare. Spot tests are unhelpful. The epiphyte L. expallens can also grow on dry rock but is C+ orange. L. sulphurea may be the fertile counterpart of this species. It is thinly scattered in Ireland and deserves to become more widely known. 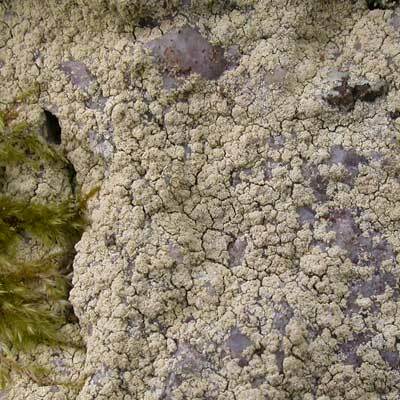 Edges of the areoles develop pale yellow soredia which can spread to dominate the thallus. Discs rare. A spot of fresh bleach has no visible effect. Simms, M. J., (2016). Lecanora orosthea (Ach.) Ach.. [In] LichenIreland.